The key to a successful wedding reception is no longer just the simple matter of booking the hottest venue and hiring the best DJs. Renting a photo booth is a great way to ensure your event is truly memorable. Of course, the hardest part for many brides is picking a single booth from the wide variety of Michigan photo booth companies. Now we all know how stressful planning a wedding can be, so included below is some simple advice that should make the decision making process that much easier. Which Michigan Photo Booth Company? While the selection of a photo booth is largely a matter of personal taste, many wedding planners seem to prefer classic-style booths. 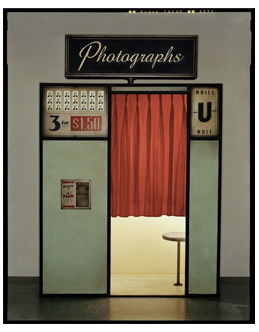 The outsides of these booths are straight out of the 1950s, and many still use the classic dip-and-dunk photographic process to produce 1.5″ by 7.4″ strips. Of course, there are also newer versions that offer the classic look while incorporating all the bells and whistles that come with digital-style photography and high quality dye-sublimation printers. For those who find these old fashioned vending-style booths a bit unattractive (as do i), there are many companies, that offer elegantly designed booths that enhance the beauty and ambiance of a formal reception even doubling as a room lighting effect. These booths also offer a variety of extras, including customized film strips that carry a special message or the names of the bride and groom. Their uniquely designed booths arrive with a removable bench seat to allow larger groups. Indeed, there is nothing quite like the charm of watching groups of 8 or more friends trying to fit into the booth all at once in a dead heat to see who can make the funniest pose. Many couples have the photo booth placed next to the bar for added enjoyment.Â You can even have it near he dance floor to really set things off. One of the best things about having a photo booth at a wedding is the ability to take virtually unlimited photos that truly capture the joy of the moment and the characters involved. The photo strips make truly unique keepsakes that your guests will cherish. Some companies, will provide an attendant to help your guests create a one-of-a-kind, custom-made scrapbook for the bride and groom, free of charge, you just provide the book. Unlike traditional guest books, which are little more than a collection of autographs, these books capture the most memorable and fun elements of your wedding day, as guests contribute their own favorite shots and messages. The attendant then creates an elegant scrapbook for the clients. Whatever photo booth company in Michigan you select, the hours of enjoyment and the years of memories it will add to your event will certainly be well worth the investment. 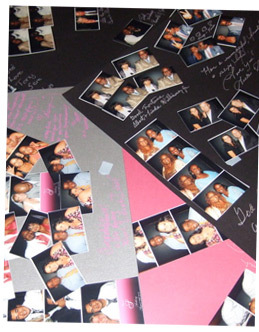 Recent wedding experience shows, your photo booth reception will take the cake!